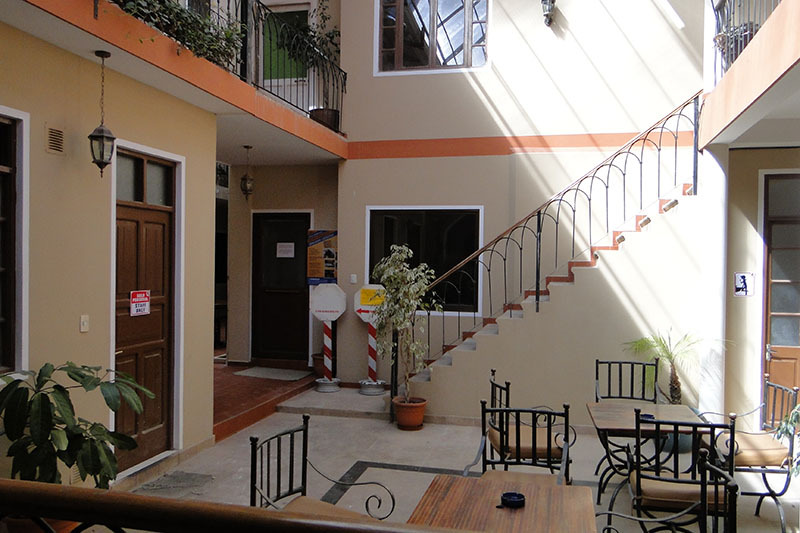 Learn Spanish in Sucre at our partner Spanish school, Academia Latinoamerica de Español. The school is located one block from the main plaza in Sucre, in Bolivar street. The school has spacious and well equiped classrooms, a wonderful terrace from where students have a view of all the city, a really nice cafe, and a travel agency and national tour operator. The school is quite small in size, with the capacity of about 40 students, which means students will be able to enjoy individual attention throughout their stay. If you decide to go away alone or with your fellow students at the weekends, an employee of the school will also be happy to help you plan your excursion. The Minigroup course in Sucre is designed to improve the students' reading, writing, listening and speaking skills. The mingroup course consists of 20 lessons Spanish per week in a group with maximum 5 students. This way the school can guarantee a very personal atmosphere. The price stated here is for an airport transfer upon arrival in Sucre. In 2019 the school is closed on: 01/01/2019 - 13/01/2019, 22/01/2019, 04/03/2019, 05/03/2019, 19/04/2019, 01/05/2019, 25/05/2019, 20/06/2019, 21/06/2019, 06/08/2019, 02/11/2019 , 25/12/2019. Missed lessons due to bank holidays will not be refunded or rescheduled. Only one-to-one lessons will be rescheduled. Combined minigroup courses in Sucre. The combined minigroup course starts on a Monday with a level test and an orientation programme. Classes start the next day. You have 20 group lessons (max. 5 participants per class), with additional 10 lessons of one-to-one tuition per week. The One-to-one Language course in Sucre is a great way for the student to quickly develop their lingustic ability in a confident and professional manner. The one-to-one course is based on the student's lingustic skills and is adapted to suit their needs. Interaction is one of the most important features in the development of a language and the one-to-one course is a great way of improving interactive skills. The student can choose what they want to study during the 20 lessons per week. Programs include all study materials and instruction in conversation, pronunciation, grammar, correspondence, idiom, vocabulary, translations and lectures. In a host family you will have the perfect chance to learn about the culture and habits of the country. The host family will meet you at the airport in Sucre. Your stay will be in a single room with a shared bathroom. The breakfast is mostly standard while the lunch is the meal of the day. Most families are 20-30 minutes by foot away from the school. Staying in a residence is the perfect way to meet local and international students in a lively environment. you can stay in a single or double room. It is a self catering residence with a fully equipped kitchen where students can prepare their own meals.